Soak Lentils in water over night, strain the following day and spread sprouts out on damp paper towel, covering with another damp paper towel and let sit 36 hours. Rinse lentils after 36 hours if they haven’t yet sprouted a “tail” at least ¼ inch long, spread the sprouts out again on clean damp paper towel and let them sit another 12-24 hours. (This is a basic method for sprouting lentils; feel free to use a sprouting jar, or trays if that is your preferred method). Chop up the romaine lettuce into 1 inch pieces, wash and pat dry. Pick the leaves off the fresh thyme and set aside, slice the pear thinly throwing out the seeds and core. I don’t toast the walnuts in keeping with the raw theme of this recipe; they can be toasted for additional flavor if preferred. Rinse the lentils thoroughly pat them dry or put them in a salad spinner. 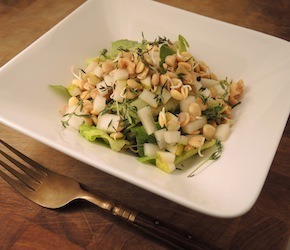 Toss lentils, pear, romaine, walnuts and thyme together, add lemon juice, olive oil, and a pinch of salt, stir again till well mixed and serve immediately. I prefer to use romaine in this recipe as it stands up well to the lemon juice, other lettuces will wilt more quickly, and if you serve this salad immediately you could use any lettuce you have on hand.